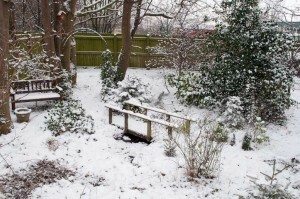 Our garden looking very picturesque in the snow. The snow settled here for the first time on Friday and it made our garden look very nice. 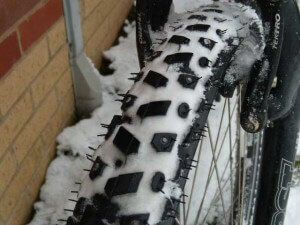 Apart from the obvious snow man making session by our daughter it also allowed me to try out my studded tires on my bike. 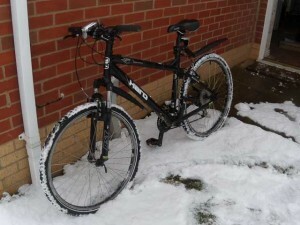 As my electric bike is slightly awkward to put new tyres on I decided to use my existing Haro mountain bike and use it a winter bike by replacing it’s tires with some Schwalbe Snow Stud tyres instead. I purchased them in August for 35 pounds for a pair. I know how difficult they are to get hold of as soon as winter arrives and the temperature drops because I couldn’t buy them last year but I was determined to be prepared this year. Coming home from work on my bike on Friday after the heavy snow had fallen I was impressed how much more grip they appeared to give compared with normal tires. I also saw several people on bikes sliding to a stop in several places, and I didn’t seem to have this problem. It could be that I was just taking it more carefully than these people but I like to think the tires were helping too. I had my previously had my doubts to be honest about how good they were but I’m happy now I put the effort in early in the year to put the tires on. The studs within the tires are slightly on the side of the tread so normally you don’t really know you are riding on them too much, but if you slightly start to lose grip they seem to catch you and stop you from sliding over. A Close up of the studs. 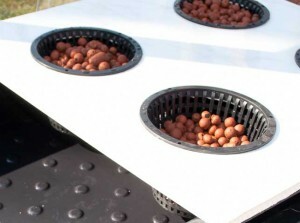 When you use them in normal conditions you have them fully inflated and you know you have got studs on because you can slightly hear them clacking on the road. While riding on ice or slippery snow you slightly deflate them, but you still get the nice feeling when you hear them bite into the surface underneath through the ice or snow. It certainly makes riding more enjoyable in the snow and ice, for me anyway.